Summer is over on the calendar but I know some ladies will have personal summer due to menopause. This week I’m going to show you some acupressure points for hot flashes. The first two are on the hand and wrist to control sweats. 後谿 (SI 3) – The first one is by the pinky on your hand. 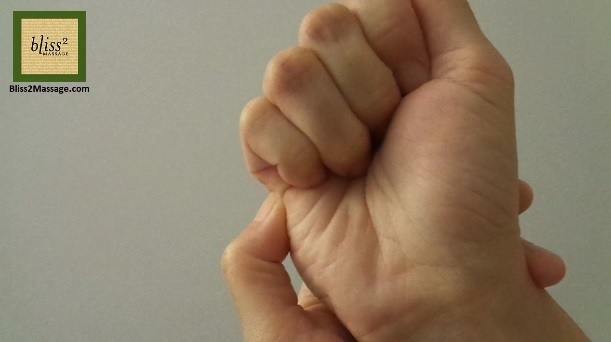 Make a fist and it’s at the end of the prominent line that sticks out. This is called Small Intestine 3. This point helps to regulate body heat and sweating. 陰郄 (H 6) – The next one is by the wrist. Find the wrist crease and find the tendon on the pinky side. 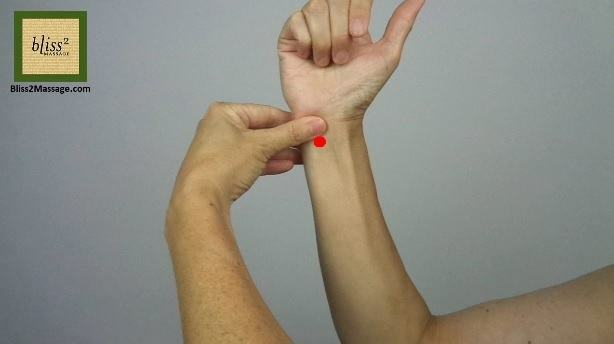 It’s half cun or half thumb width from the wrist crease so put the center line of your thumb right over the wrist crease and it’s where the bottom edge of the thumbs is next to the tendon on the inside. This is called Heart 6. This point is especially good for night sweats. The next two are on the leg and foot to bring down the heat to the lower body. 太衝 (LV 3) – The second one is at the end of the valley between the big toe and the second toe. You will feel a very distinct sensation. This is called Liver 3. You can press or make short strokes with your fingertips. If it’s hard to reach, use a tool such as back of the pencil with the eraser. You can also press with your heel. If your toe is flexible enough you can also press it with a hooked big toe. Press these points for one minute. There are many acupressure points for certain health conditions and one works better than the other. It’s something you won’t know unless you try it. I have done another set of acupressure points 6 years ago so if you haven’t seen that old video, I’ll put the link below so you can try them too. I hope you find the points that work for you.